Despite the fact that I only live a few hours away, it had been years since I spent any time in St. Louis. The opportunity came up when Mom was visiting me and I didn’t have to think twice about it. 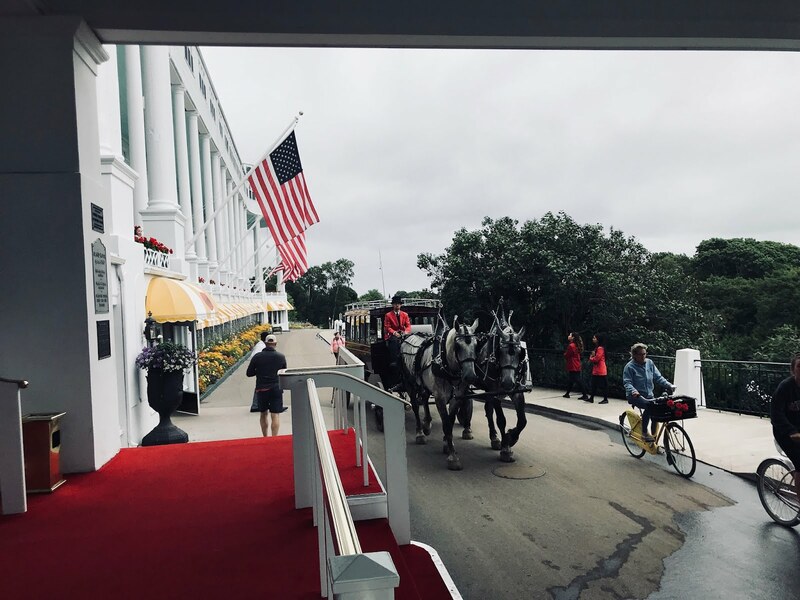 Mary and Donna at the St.Louis Tourism Board worked hard to set up a girls’ getaway itinerary and it couldn’t have been better. The trip was a quick and easy two and a half hours to the Four Seasons St. Louis. I had heard a lot about this property, which has shown up on multiple lists as a top accommodation in the country. 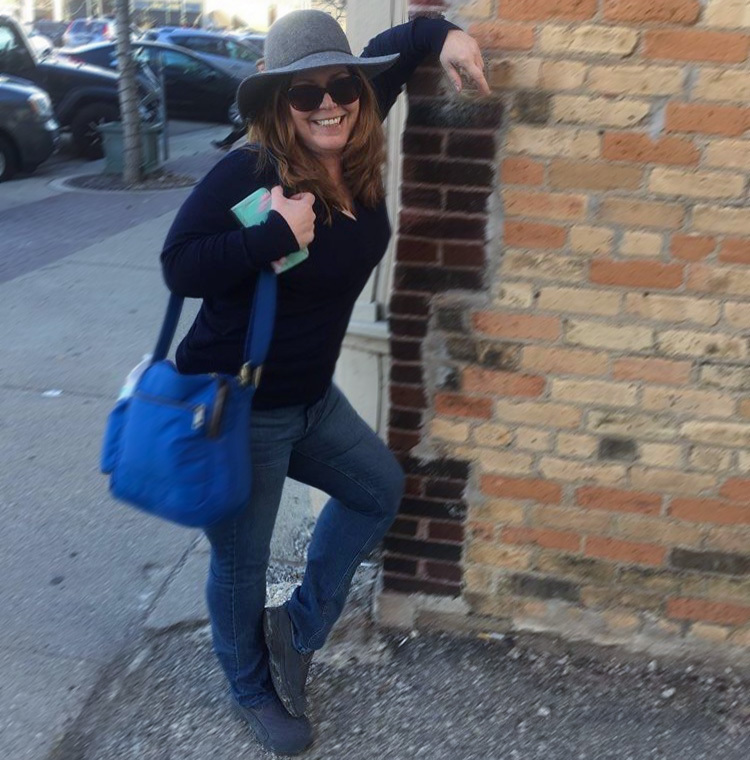 I certainly got that impression from the moment we stepped out of the car. The hotel was beautiful and the staff quite attentive. 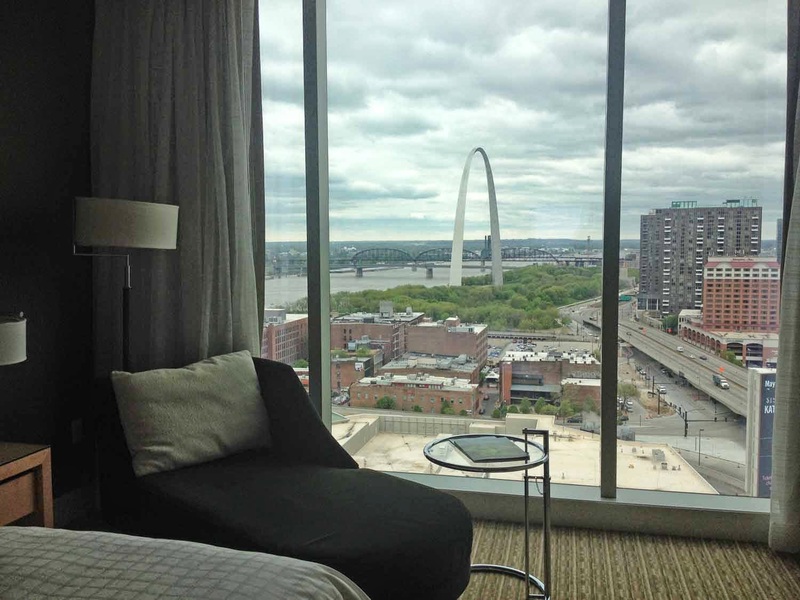 We had a one bedroom, two bath suite with a phenomenal view of the Gateway Arch. It also had the touches I appreciated in a top tier hotel, such as thick and comfortable robes and L’Occitane bath amenities, but something I wish more hotels on this level would offer, complimentary internet. We only had a few minutes to settle in before Mary picked us up. She told us how the hotel also had a seven million dollar modern art collection. 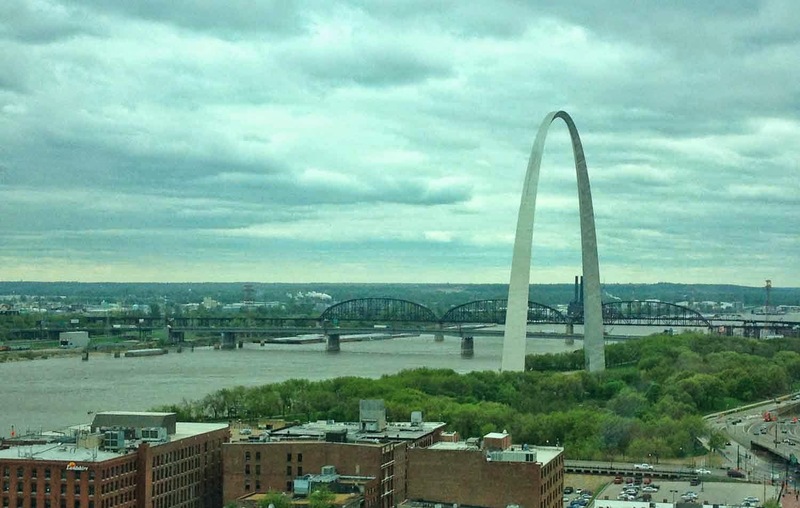 We started with a driving tour through St. Louis and a bit of a history lesson. I learned that this is one of the oldest Midwest cities and had in fact just celebrated its 250th birthday. One of the reasons St. Louis was so popular so long ago was that it’s only 10 miles up the Mississippi River from here to the Missouri. A revolutionary battle was fought in St. Louis and the Old Courthouse (now a museum) is where the Dred Scot Freedom Trials took place. 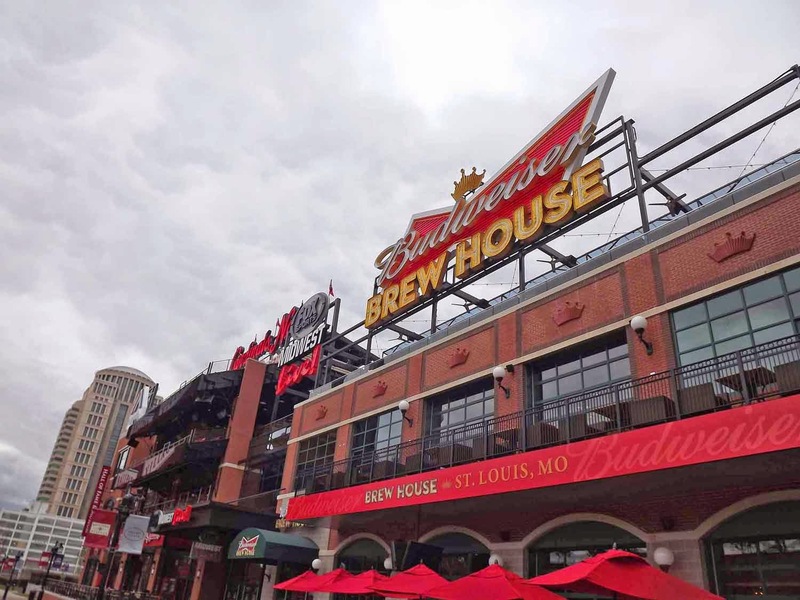 In addition to the courthouse, we passed by Ballpark Village. Even though I knew I was going there in a month, I wanted to take a quick peek at this new entertainment center next to Busch Stadium. It’s also interesting how St. Louis has all three of their sports teams – the Cardinals baseball, Rams football, and Blues hockey – all downtown. They are also all linked by the Metro Link, which connects right to the airport and the parks. 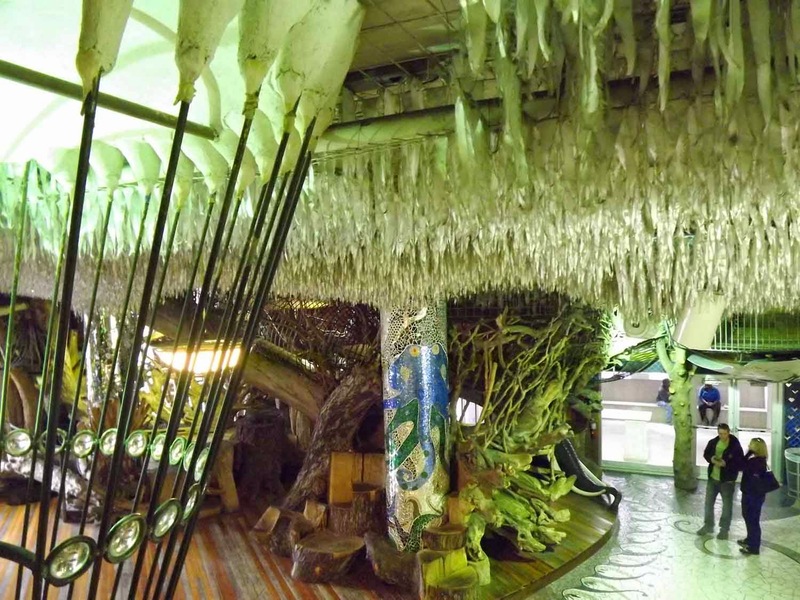 Our first stop was at City Museum. While this place sounds unimpressive, it’s a must see for everyone. 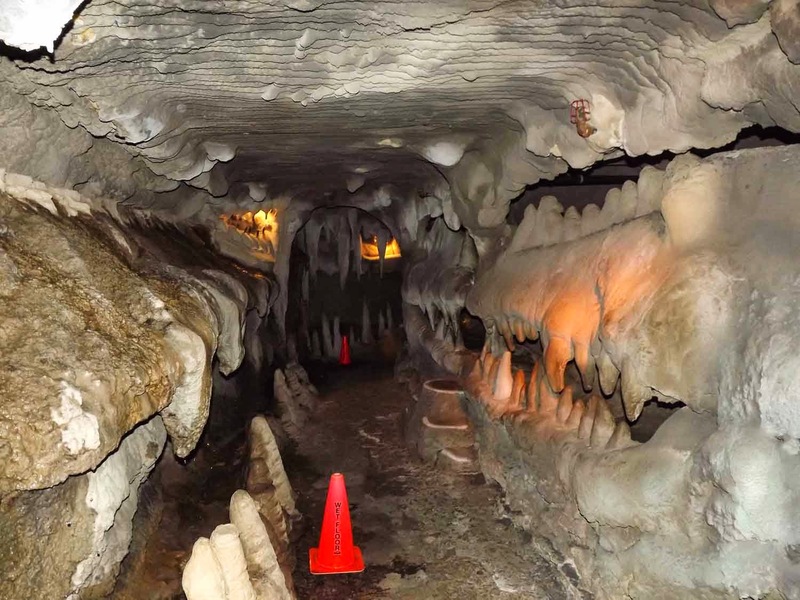 It’s pretty much an indoor paradise for kids of all ages to explore, climb, slide, and learn. The eclectic collection of pieces from places around the world is just amazing for the grownups (at least those who don’t also want to climb around) to admire. We were pretty hungry by the time we arrived so we first headed to Samwiches. 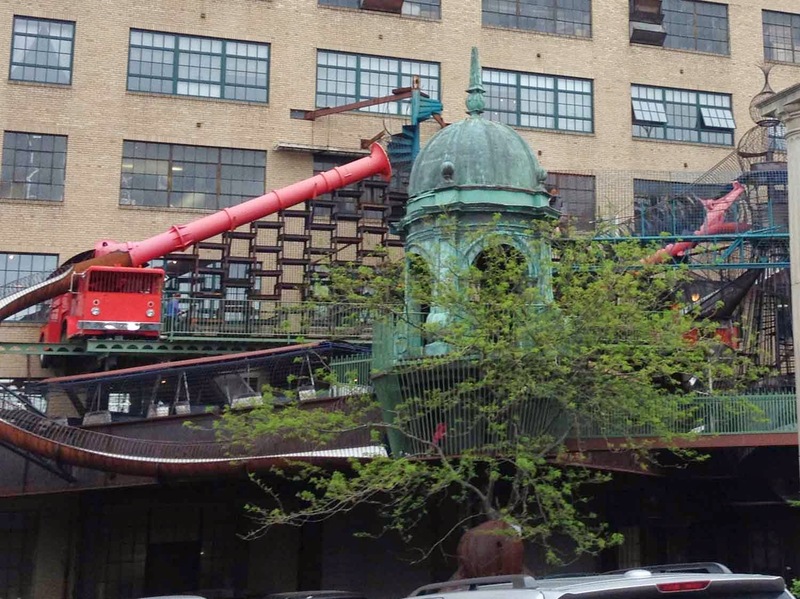 City Museum also has its own Donut Bar, as well as a real bar for those of age. I had a Pulled Pork Sandwich worthy of Midwest barbecue and a fresh baked chocolate chip cookie I shared with Mom. 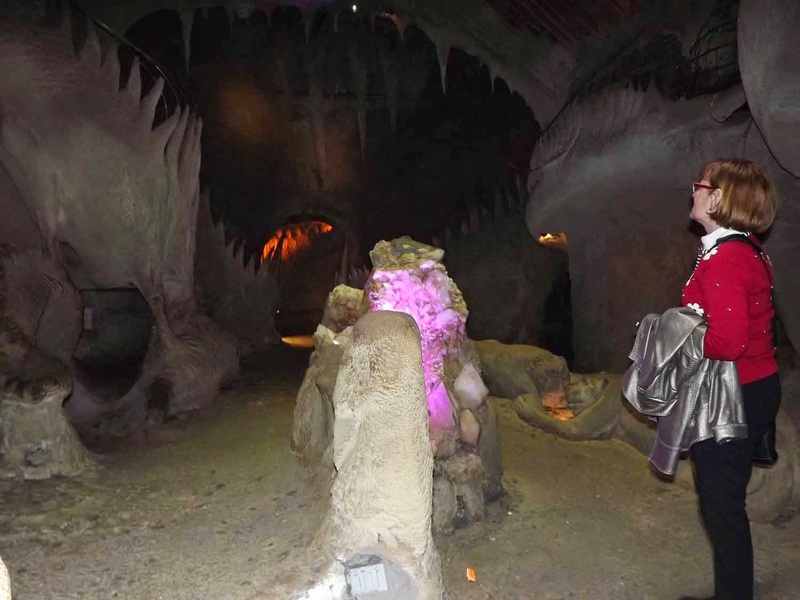 We spent about two hours exploring City Museum, but I suggest spending a day there to really see everything and check out the Circus Harmony shows. 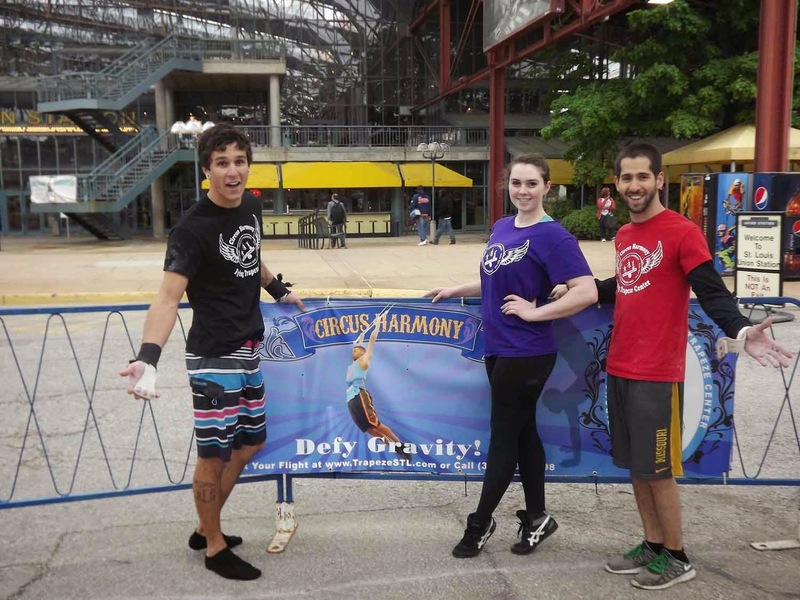 The Circus Harmony at City Museum is the same company that has a Flying Trapeze School in Union Station. That was our next stop. The 12 year old gymnast in my wanted to climb right up there, but the more practical woman with a not so forgiving back declined. I did stick around to watch the performers for a bit (see video below). On the way back to the hotel, Mary told us about all the free activities for families in St. Louis, including the Zoo, Science Center and Grant’s Farm. I remembered the latter as my parents managed to save an 8mm film of a goat eating the bottom of my dress when I was about three years old! We got back to the Four Seasons St. Louis in time to change for dinner at Ciello. It was too cool and rainy to sit outside on their large patio, but we were able to still have nice views of the Arch from our table by the window. 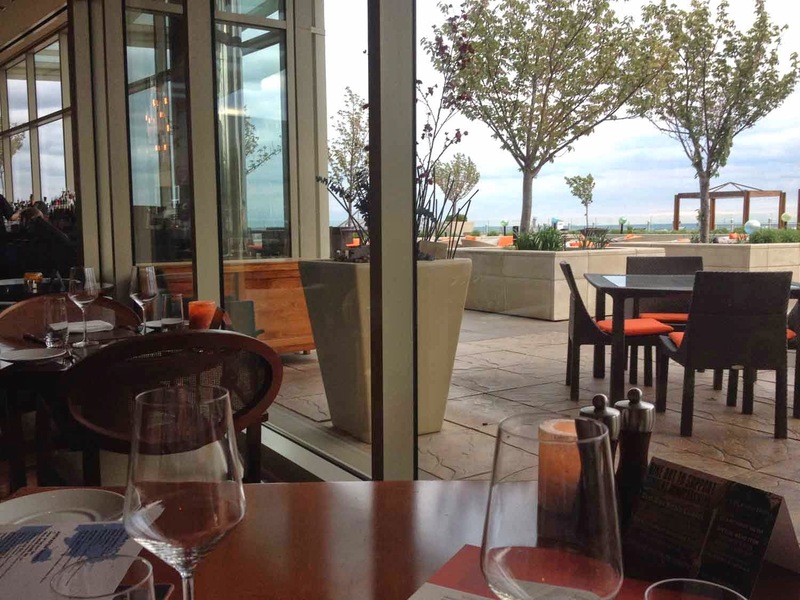 They have an extensive wine menu and I enjoyed a glass of Dr. Hermann Riesling while looking over the menu created by the new chef, Gian Nicola Colucci. There is always a tasting menu available. As someone with food allergies, I was quite impressed with how easily you could make substitutions while still getting to try a number of courses. Mom let me order and we shared all of it. 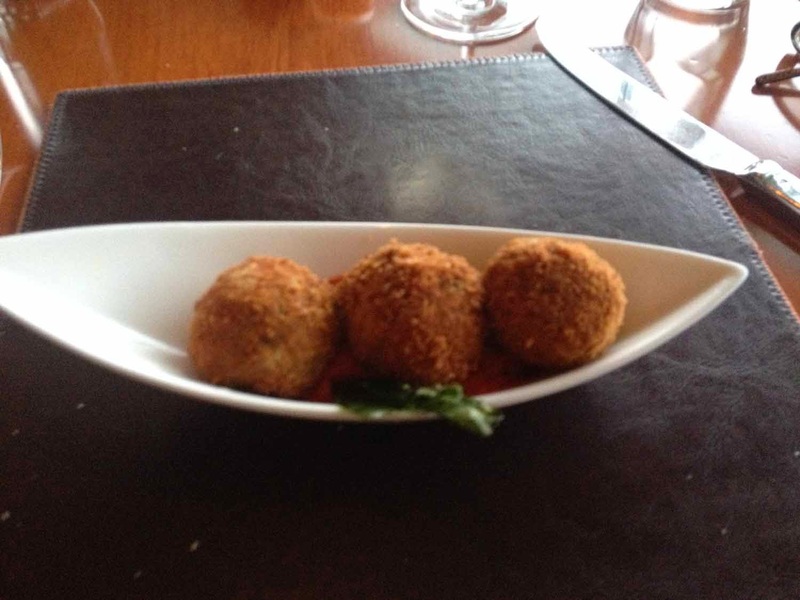 We started with a moist and tasty Arancini and a fresh and flavorful Bruschetta. 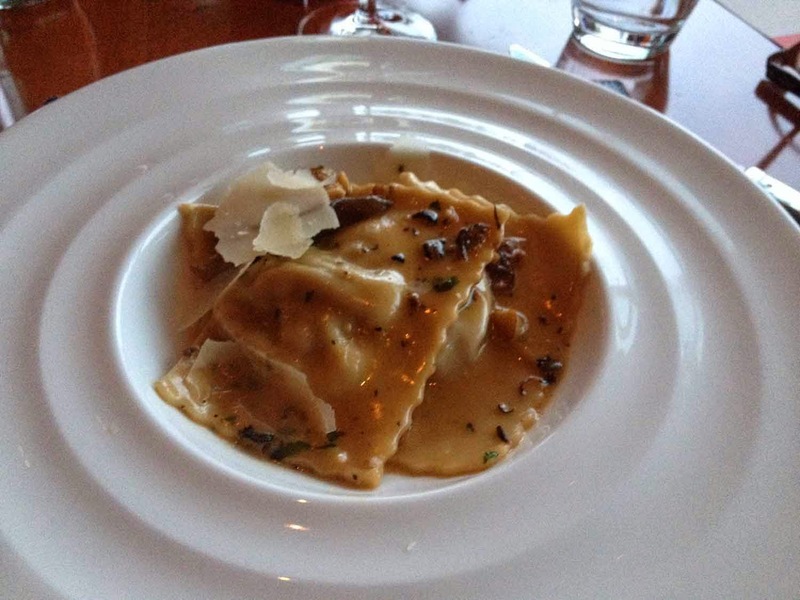 Next, was a Veal Truffle Ravioli which was as delicious as the waiter told us it would be. For the main course, Mom had the Veal Filet and I ordered the Short Ribs. The ribs were done to perfection, but we both found the veal and accompaniments to be too heavy on the salt. Even though we did not finish everything on our plates, I couldn’t give an honest opinion of the tasting menu without trying the dessert. The Chocolate Torte was quite good, but it was the White Chocolate Cheesecake that stole my heart. We went straight up to the room after dinner to rest up for another full day in St. Louis.